Almost everyone has an identity crisis at some point in his or her life. This is true even if your soul doesn't leave your body and get transported into, say, the body of your dead lover. Obviously in the latter case, "Who am I?" is more than just a rhetorical question. 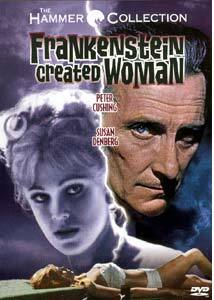 Such is the situation in the fourth Hammer Frankenstein film, the 1967 Frankenstein Created Woman. Director Terence Fisher here eschews the usual gore and grue and titillating sexual content in favor of the more considered issue of what it means to be alive, and what makes a person who he or she (or both) is. Dr. Frankenstein (Peter Cushing, continuing in his most notable role) is engaged in experiments to determine how long the soul remains in the body, going so far as to have himself returned from the dead in an early sequence. He is assisted in his work by Dr. Hertz (Thorley Walters) and young Hans (Robert Morris). Hans is in love with the scarred and crippled Christina (Susan Denberg), the daughter of the local innkeeper. When her father turns up dead, suspicion wrongfully falls on Hans, and he is sentenced to the guillotine. Frankenstein sees an obvious opportunity here and arranges to recover Hans' body. Christina, overcome with grief, commits suicide, leading to the inevitable mad foray into things man is not meant to know: the implantation of Hans' soul into Christina's body. Problems ensue when the now-healed Christina begins to recall what happened under Hans' influence and seeks revenge on the men who killed her father. Most of the gore in the film consists of Hans' disembodied head (an obvious and poorly done fake) reappearing here and there. The film is surprisingly restrained for a mid-1960's Hammer picture. The restraint works well here, as the gentler approach gives the possessed Christina the ability to use seduction to lull the objects of her revenge into complacence and to bring on their well-deserved ends. Unlike the usual rampaging Frankenstein monster, Christina is extremely focused. When one accepts the notion of soul transference and revival from the dead, this film still makes one wonder why the process causes Christina's hair to change from black to blonde; Dr. Frankenstein merely observes that "The hair has changed color as expected." For some reason this change is a sticking point for me. No doubt the blonde version was to support the parallel with Brigitte Bardot; the title is a parody of the 1956 Roger Vadim film And God Created Woman (coincidentally just released on DVD by Criterion). Image Transfer Review: Anchor Bay gives us another beautiful transfer. The film is shot in a very limited earth-color palette, but the occasional item displays a beautiful red or blue. In particular, the resurrection sequences have a reddish hue which adds to the unearthliness of the action. Blacks are good, but not great. I saw little artifacting of any kind. Very little to complain about here. Bit rates average an exceptional 8 Mbps. Audio Transfer Review: The audio is a DD 2.0 mono. There is no hiss or noise of any kind. Dialogue is clear throughout (which is good because there are no subtitles). Music has good range and is not distorted, but occasionally sounds just a bit on the tinny side. It's perfectly adequate for a film of this vintage. World of Hammer episode, "The Curse of Frankenstein"
Extras Review: The principal extra is a 1990 episode from The World of Hammer focusing on the Frankenstein film series. The program runs 24m:54s. Overall, this is just a collection of random clips from the films with a linking narration by Oliver Reed. Very little serious information is imparted and the program is in general disappointing. All of the clips are presented full frame. Oddly enough, the next movie in the series, Frankenstein Must Be Destroyed is skipped over completely without so much as a mention. There are two trailers, one for this film by itself and one on a double feature program with The Mummy's Shroud (also being released on DVD by Anchor Bay, so you can reenact this double feature). Both are in passable but not great condition. The disc also provides two TV spots for this same double feature, which essentially repeat portions of the trailers. By comparison, the picture quality of the main feature is astonishing. Chaptering is adequate for a film of this length. No subtitles or production notes of any kind are provided. The menus, while static, have an amusing transitional animation involving a guillotine. Another winner from Anchor Bay. Gorehounds will be sorely disappointed, but the film is thoughtful and well-done. Picture quality is first-rate, but the extras are a little marginal.